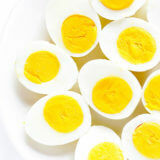 Learn how to make hard-boiled eggs with this step-by-step video and easy recipe. 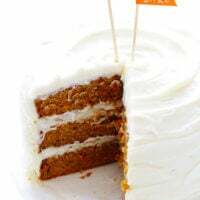 It’s totally simple, and totally delicious! Anyone else always think of Ramona Quimby when you eat a hard-boiled egg? Or maybe I should say, the not-hard-boiled egg? ? 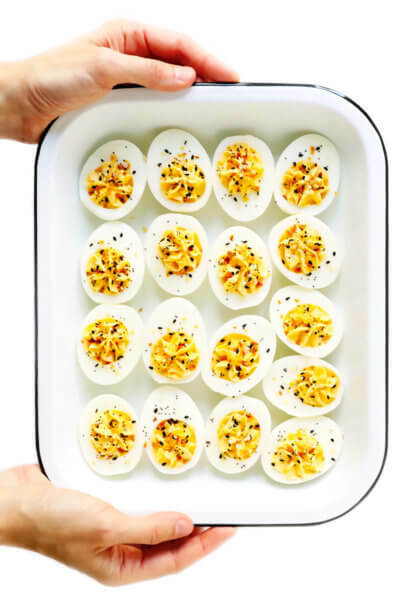 Well, whether hard-boiled eggs also happen to be your go-to pop of protein to pack in your lunchbox, or keep in the fridge for easy breakfasts, or pop on a cobb salad, or “devil” on Easter, or whatever sounds most egg-cellent to you — today I’m sharing my best tips and tricks (and a new video!) 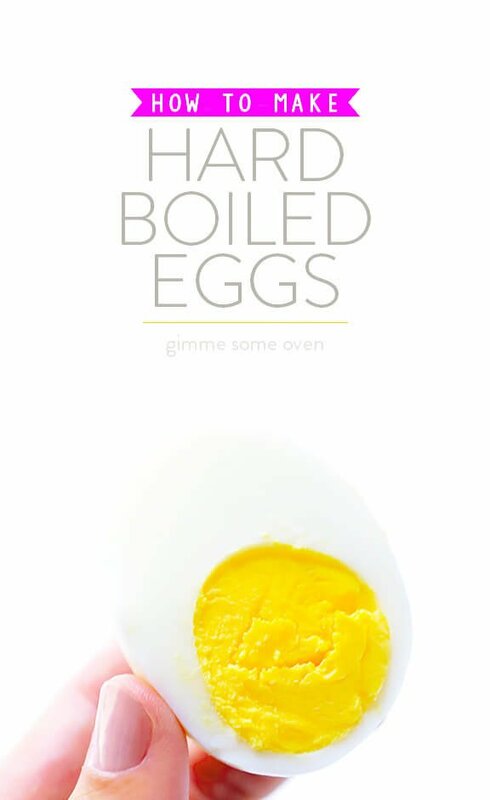 for how to hard-boil eggs perfectly every time. 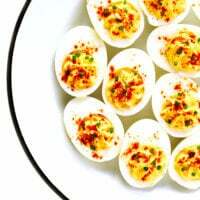 I actually first shared this hard-boiled egg recipe a few years ago, but it seemed like the perfect one to bring back for our weeklong series on how to cook eggs. Similar to what we discussed in yesterday’s tutorial about how to make soft-boiled eggs, somewhat older eggs (versus fresh, brand-new eggs) are ideal for hard-boiling. They tend to peel easier, and crack less easily when boiling. 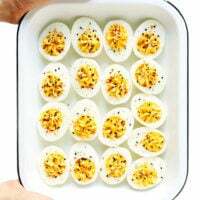 To make hard-boiled eggs, gently place your eggs in an empty saucepan or stockpot, and then fill the pan with cold water so that there is at least 1 inch of water on top of the eggs (if using 6 or less eggs), or 1.5-2 inches of water on top of the eggs (if using 7-14 eggs). Transfer pan to the stove (uncovered) and heat over medium-high heat until the water reaches a rolling boil (we’re talkin’ big bubbles). Transfer pan to the stove (uncovered) and heat over medium-high heat until the water reaches a rolling boil. Let the eggs boil for 1 minute (no more). Then remove the pan from the heat, and cover snugly with a lid. Let the eggs continue to cook in the pan for 9-11 minutes, or until the yolks reach your desired level of doneness. Carefully drain out the hot water (or you can also transfer the eggs to a colander, and then return them to the pot). Then fill the pot with ice water, and let the eggs sit for a few minutes until they are completely chilled. You can now either transfer them to a sealed container and refrigerate for up to 1 week. Or you can go ahead and peel them. To do so, I find it’s easiest to crack a big ring all around the center circumference of the egg by rolling it on the counter. But you can go with whatever works for you. Then slice and serve! 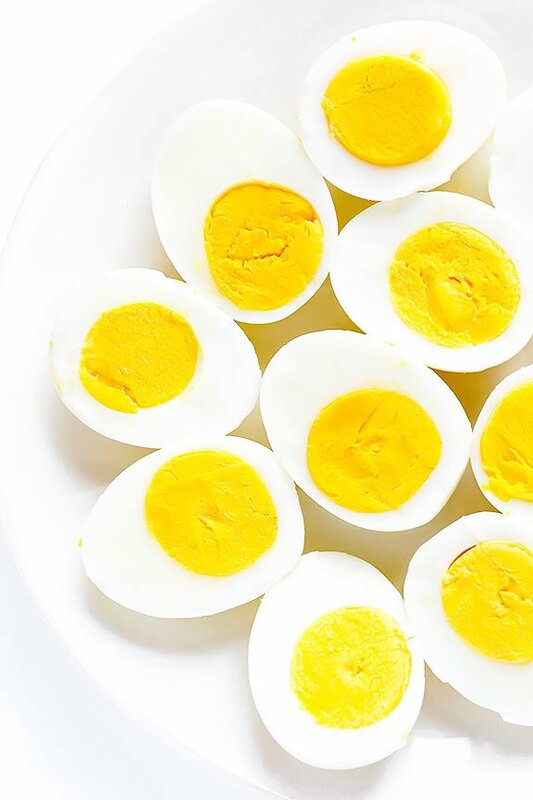 Learn how to make perfectly hard-boiled eggs with this simple method! 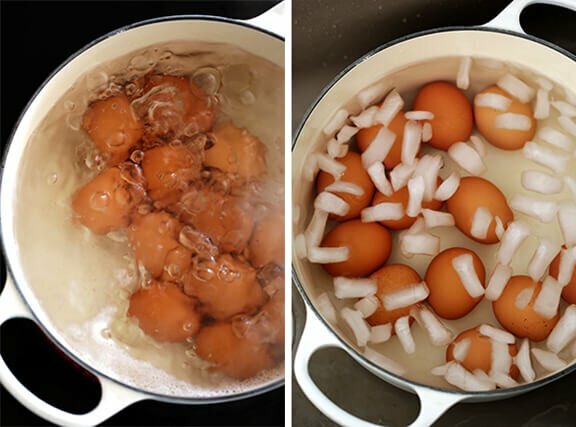 Gently place your eggs in an empty saucepan or stockpot, and then fill the pan with cold water so that there is at least 1 inch of water on top of the eggs (if using 6 or less eggs), or 1.5-2 inches of water on top of the eggs (if using 7-14 eggs). Transfer pan to the stove (uncovered) and heat over medium-high heat until the water reaches a rolling boil. Let the eggs boil for 1 minute (no more). Then remove the pan from the heat, and cover snugly with a lid. Let the eggs continue to cook in the pan for 9-11* minutes, or until the yolks reach your desired level of doneness. Peel and serve the eggs immediately. Or transfer them to a sealed container and refrigerate for up to 1 week. *Granted, different pots/stoves may cause the eggs to cook more/less quickly, so test what cooking time will work best in your kitchen. I’ve found a good solid 10 minutes of cooking time works best for me. Yeah, isn’t that crazy?! We’re glad you found this helpful, Monica! Hmmm, that’s interesting, Nicole, it must be the altitude! I am obsessed with hard-boiled eggs lately. 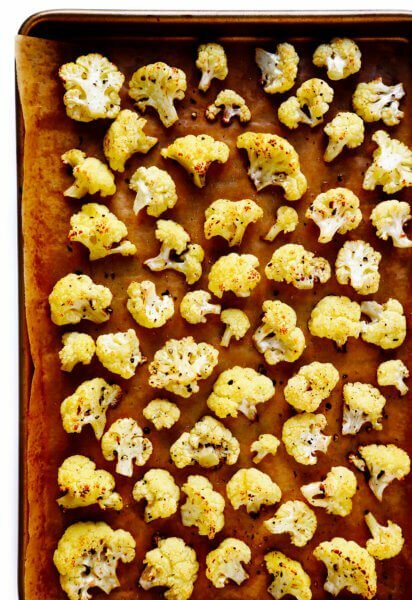 So many different ways to enjoy them—I like making a batch at the beginning of the week and using them for salads, snacks, sandwiches, or other random ideas that sound good. 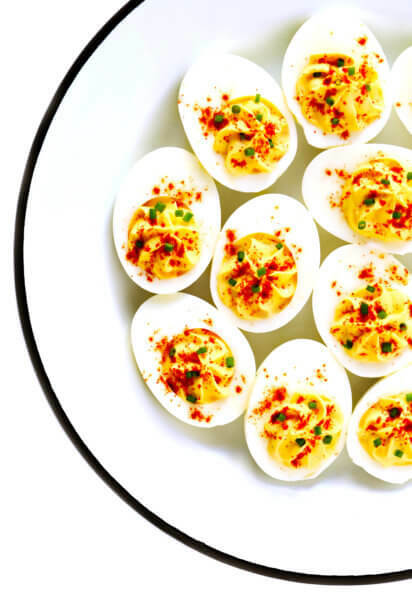 My daughters LOVE hard-boiled eggs and there’s really a science to making the perfect ones. I’m pinning this for future reference because I know I’ll be using it a lot! I don’t even like hard-boiled eggs, but I LOVE that you referenced Ramona Quimby. Really good looking eggs, Ali. And good looking pix, too. Your method is an interesting variant on one I used in Garde Mange just out of culinary school. The Chef was a screamer so we all learned quickly. Heh. I’m looking forward to field testing this recipe. Thanx for sharing! I did not know about the peeling trick. I always have trouble peeling my eggs so I’m going to try the trick out for sure. I can tell these are cooked to perfection! That yolk is absolutely gorgeous! I eat hard boiled eggs for lunch 3-4 times a week, but since getting our own chickens and having fresh eggs, this method no longer works for me. ? Instead, I bring my water to a boil FIRST then add my eggs. I boil them on medium high for 15 minutes. When they are done, I fill my pot with cold water and let them sit for a minute or so. Perfect hard boiled eggs every time ? Bring water to a boil (enough to cover by at least an inch when eggs are added). Add COLD eggs to boiling water. I put them on a slotted spoon and lower into the boiling water gently so as to not crack the shell. When water comes back to a boil, start timer for 15 min (16 or 17 min if extra large eggs). When time is up, drain and cover with cold tap water. You could add ice but I’ve had success without doing this. After they have cooled enough to handle I crack them and roll them against the side of the sink to crack them all around. Then start peeling under running cold water. They peel right out, no problem. I leave them in the cold water with the shells for a couple of minutes so that they finish cooling. Then I lift them out of the water and let them drain for 10 – 15 min in the dish drainer. When dry, I place them in a rubbermaid container with a folded paper towel beneath and on top. I usually do 5 at a time as more than that don’t keep in the fridge. Good luck. 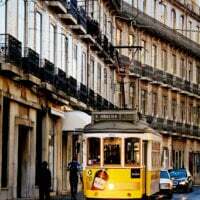 Let me know if you have success with this method. Dear Husband eats a hard boiled egg every day with his oatmeal and banana. Thanks for sharing with us, Maggie, this is helpful to know! 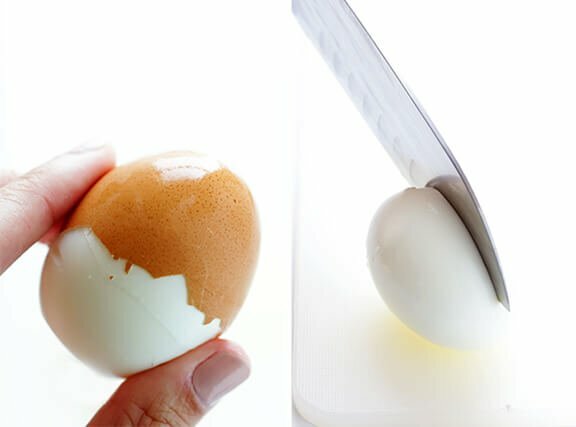 I’ve tried every method out there and the only one that results in easy to peel eggs consistently is the following: 1. Bring pot of water to a boil; 2. Add the eggs to the boiling water (I use a large spoon to do this) and boil for 10 minutes; 3. 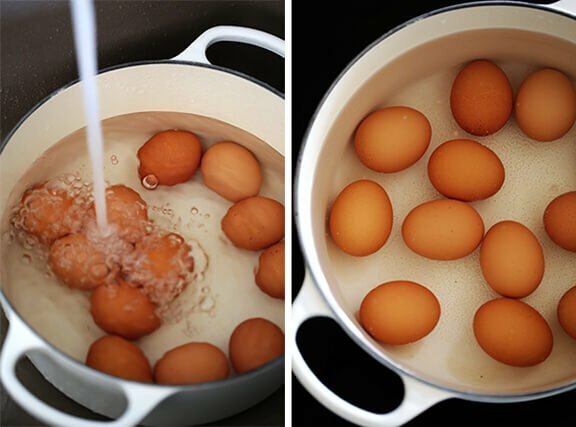 Remove the pan from the heat and let the eggs sit in the water for 5 minutes; 4. Drain hot water and cool the eggs in a cold water bath (no ice needed for this method). There is nothing worse in egg world than a hard boiled egg that is impossible to peel! 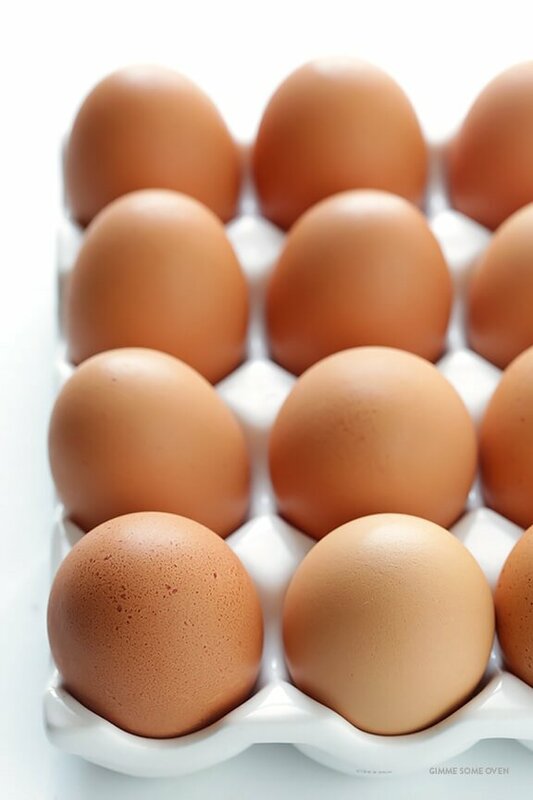 Although the heat shock can crack a few of the eggs when they’re added to the boiling water, it’s still worth it – and a note on that: brown eggs crack less frequently than white eggs (thicker shell? ), and possibly allowing the eggs to come to room temperature first would eliminate cracking. As a kid I wasted many a dozen eggs trying to get them just right !! Finally gave up. But my husband loves them, so I tried again. No luck until one day while shopping I found a real treasure !! You probably won’t post this but I wanted to share it with you. Make great egg salad sandwiches and so handy for a quick snack. 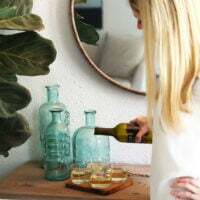 I love your website, you come up with some great tips and recipes………keep up the good work. 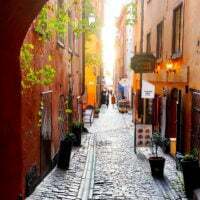 Very cool, thanks for sharing with us, Jennifer!